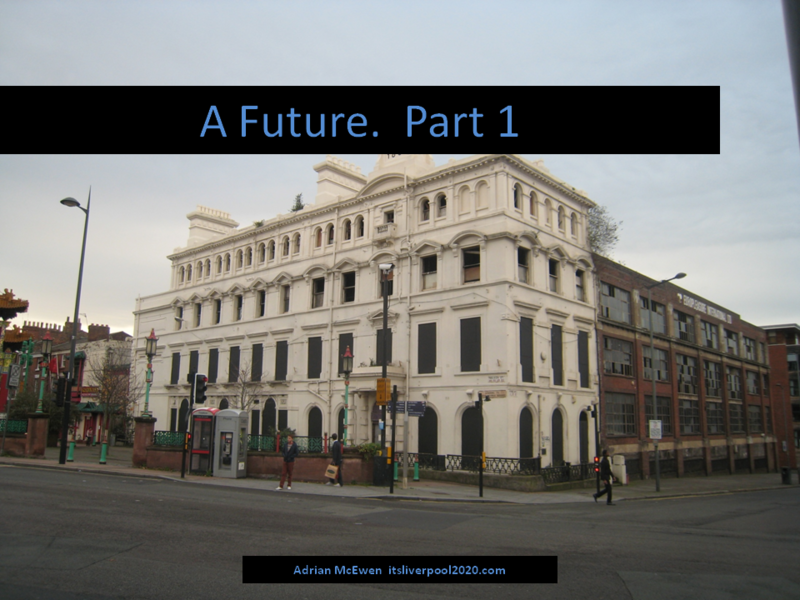 The idea was to inspire and collect stories about a Liverpool of the future, to help us talk about where we want to go and how we might get there. Sadly I didn't have the time and/or energy to drive the project forward, and it failed to do anything much, beyond me writing (and presenting) this talk. 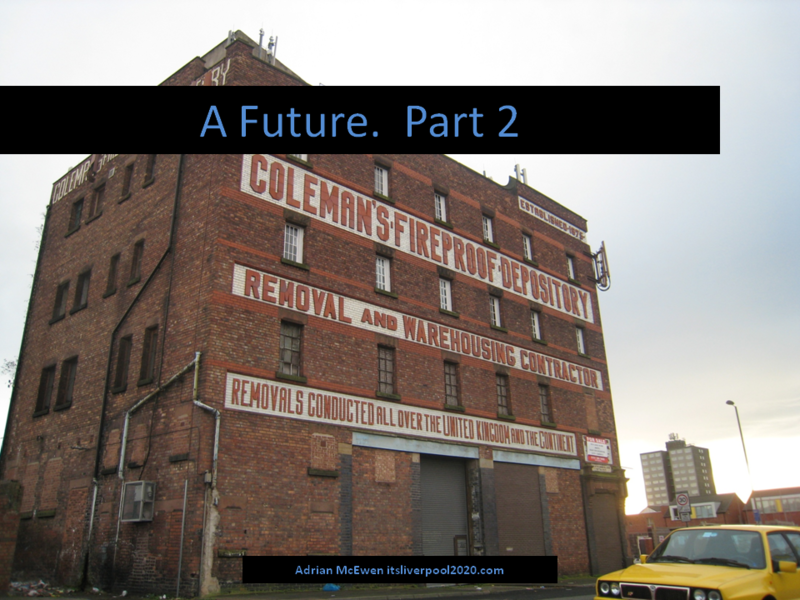 The associated website is long gone, and I hadn't ever published the slides/notes elsewhere - something I discovered when trying to find a URL for it to share with someone the other day. So, this blog post is to fix that. I leave the bakery and cross the street to DoES Liverpool. We moved into the old Europleasure International building back in 2013 when we’d outgrown our space at Gostins and since then have expanded next-door into the Swedish hotel too. I swipe my Walrus card against the door to gain access and am met with the familiar sight of people working on interesting projects. The ground floor is where all the heavy machinery lives – the lathes, Shop-bot CNC routers, the big laser cutters… I don’t venture any further in, but head up to the first floor. The first floor has fewer of the machines, and it’s split into an assortment of open plan areas with desks and a couple of meeting rooms. There are more people working from laptops here, though there’s some soldering going on over in one corner and one of the meeting rooms is awash with bits of blue prototyping foam. I drop by the desks occupied by one of the web agencies working out of DoES – to double-check they’re still on for our meeting later, and then head up to my desk on the top floor. The top floor-and-a-bit is taken up with MCQN Ltd, and it’s from here that we design, prototype and code the devices that are making peoples lives easier and a bit more fun. Bubblino is still sat doing his thing, but has been joined on the “shelves of things” by a wealth of other items. As I sit down at my desk, one of the project leads gets a call on her mobile. It’s the factory, to let her know that the run of prototype PCBs she sent them yesterday is ready to be picked up. She grabs her keys, and a minute later is unlocking one of the bikes from the public bike station at the Chinese Arch and heading down Great George Street. Ten minutes later, she’s parked up outside the factory. Most of the work is mechanised these days – there are all sorts of CNC machines, pick-and-place machines building PCBs, and reflow ovens doing the soldering, but robots are as cheap to run in the UK as they are in China, and this means we can see what working conditions are like and provide this sort of more responsive work. There are still staff here, and there’s nothing to stop the talented and more ambitious ones from working their way up from supervising the machines to designing products. Back at DoES Liverpool I’ve had my meeting, and am thinking about lunch. 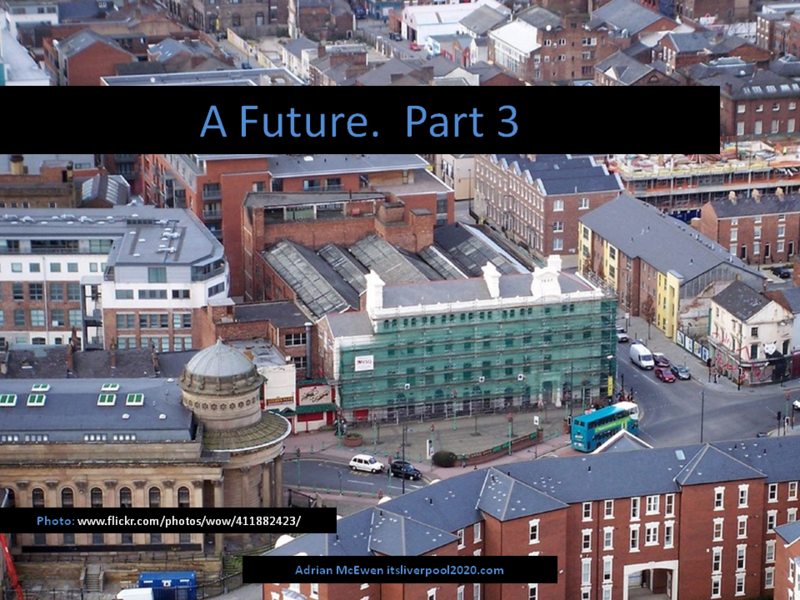 I stick my head into the mapme.at office – they’re also doing well, having helped MCQN Ltd lead the charge that saw Liverpool emerge as the leading city for the Internet of Things, and have a fair chunk of the Swedish hotel, overlooking the Anglican cathedral. John is free for lunch, and as it’s a nice day we head up to the roof terrace. The South side of the roof is given over to solar panels, and most of the rest is covered in raised beds growing vegetables. It’s one of many sites dotted around the city which are looked after by the Liverpool Urban Farm. That grew, if you’ll pardon the pun, out of the Transition Towns group, and is providing locally grown produce along with quite a few jobs. A couple of the DoES crowd are involved, providing some of the tech that making maintaining the disparate sites easier. I pick a few of the late tomatoes, and some salad leaves and drop them into the payment scales in the corner. A swipe of my Walrus card means they’ll be charged to my monthly bill. As we sit eating lunch, John spots one of the Liverpool Networks electric-trike-vans on Berry Street, which reminds him to tell me that their public WiFi network has reached Garston. We discuss how great it is that something that started out as a little collaboration between LivLUG, Leaf and Bold St Coffee to provide free WiFi on Bold Street has grown into a national company, teaching school-leavers how to build and install the WiFi hotspots in their factory in Everton, and seeding similar companies up and down the country. And with lunch finished, we head inside to get back to work. Life in a resurgent Liverpool is busy but good. 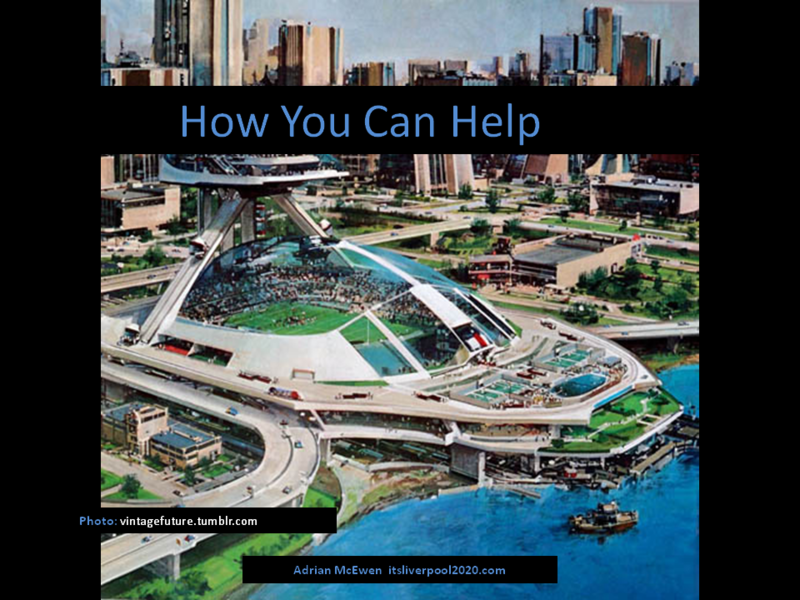 A lightweight distributed blogging project to encourage more discussion and thinking about how we want the city to evolve. 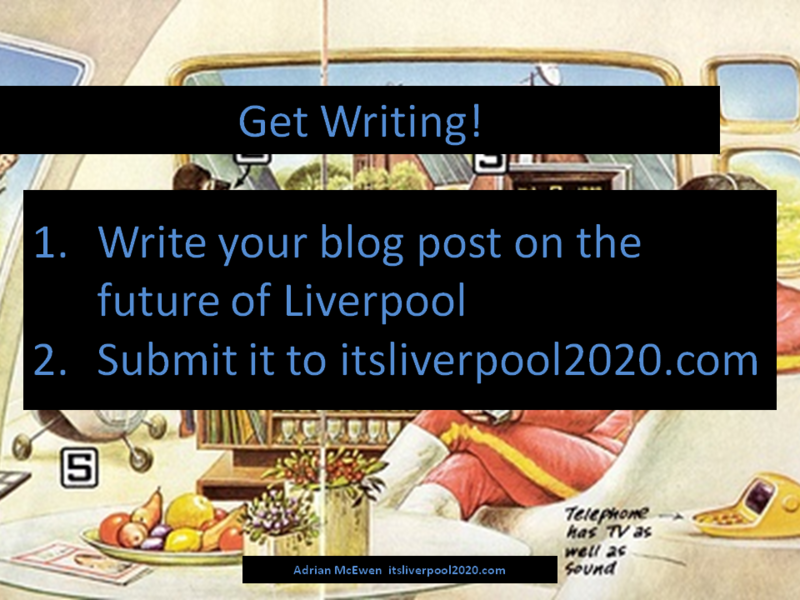 We want people to write about what they hope Liverpool could be like, should be like, in the year 2020. It’s a deliberately loose brief – you could write about the city as a whole; about your specific neighbourhood; about the architecture, the nightlife, the businesses… Whatever you like. 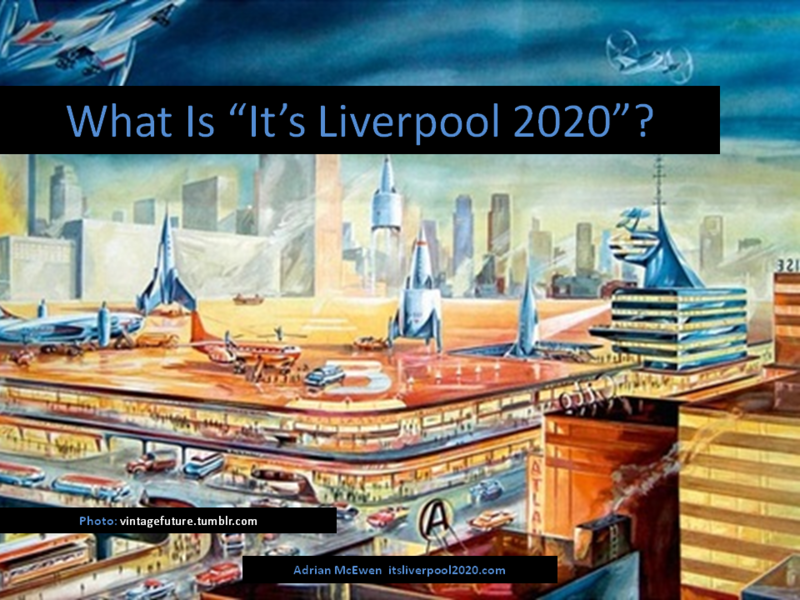 There’s a website at itsliverpool2020.com, but that’s just to point people at the different entries, and feature some of the more interesting/controversial/well-written pieces. Beyond that, we’ll see how it goes – it would be good to feed into the council’s 10-year plan, and maybe it will raise issues for the mayoral candidates to answer. Maybe some of the entries will be featured in the Echo or on 7 Streets. Maybe we’ll use newspaperclub to publish a compendium of them. Mostly I hope it will help us work out what sort of city we’ll build. Submit your entry to the project.